Keep your feet warm with these 6 Hour Heat Pax Foot Warmers from Occunomix. Designed to comfortably fit the insole of your shoe. Air Activated Instant Warmth for use in boots or shoes. Warms your entire foot during winter activities, not just your toes. Each package contains a pair of single use foot warmers that can be disposed of after use. 25% warmer in the first 2 hours than leading brands. Available in 5 pair pack or 30 pair box. 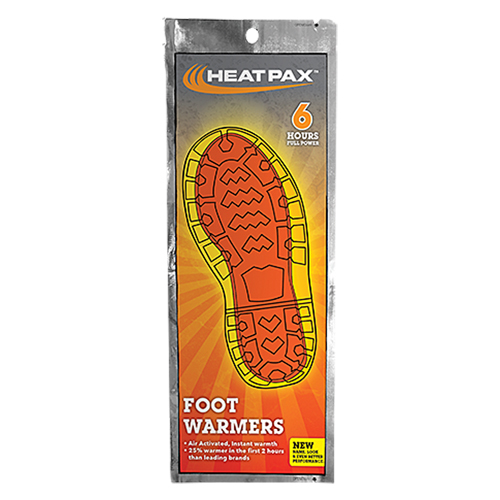 To activate warming: Just remove foot warmers from packaging, shake for 10 seconds and then place in shoe, boot or pocket. Contact us for quantity pricing and availability.